Whether it’s a wedding, day party or just a sunny day – spring weather calls for all the fun and colorful dresses! I love when it gets warm enough in Texas to don a dress because honestly the whole jeans and cardigan looks get old after a while, am I right? I’ve been having so much fun scouring Amazon every other week to find new, cute things for y’all. 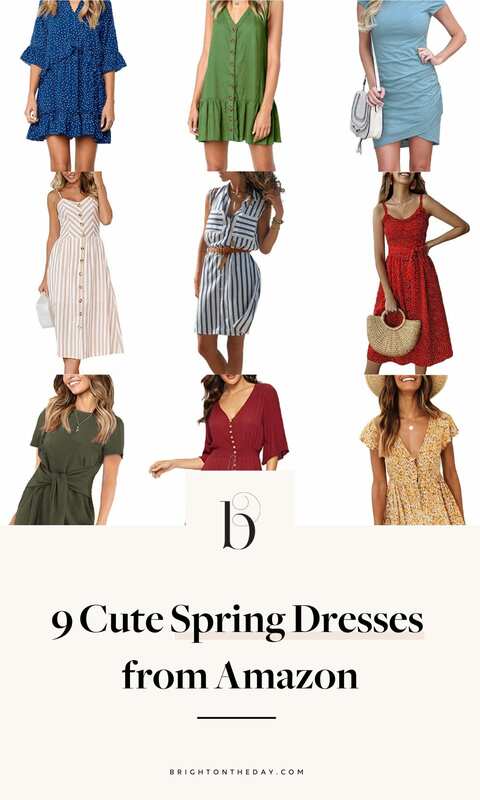 This week I’m sharing nine of my favorite dresses I’ve come across recently. See below for a little bit on why I love certain styles! Also – most of these come in so many different colors and patterns so you can pick which one suits your style best! Pink Chevron Stripe Dress – This style is so classic and will last you multiple seasons. I also LOVE this whole tortoiseshell button trend going on right now. Pair this one with sneakers or a cute flat sandal & you’re set! Blue Polka Dot Dress – I love this style because if you are a 9-to-5 office woman, this dress can be styled with a closed toe bootie or heel to transition from work to play! Blue Striped Shirtdress – O. M. Gee! Honestly, I can’t get enough of this dress because it works so well for so many people. Mom on the go – wear this dress. Teacher at school – this dress paired with cardigan, you’re set. Brunch with the gals on a Sunday – throw on this dress. I’m obsessed, y’all! Red Button Up Dress – If it is still a bit chilly where you live, this dress is perfect since it has sleeves and is a bit longer. Also perfect for the 9-to-5 babes! Blue T-Shirt Dress – If you only buy one of these dresses, this would be my #1 recommendation. This dress is so versatile, not to mention comes in so many colors, and you can dress it up or down depending on accessories.